Today we’re talking about Venice 10 most beautiful palaces to go visit. In our last post, we told you about how to plan a day to explore Venice. Today let’s assume that you have more time to visit the magical city of Venice. 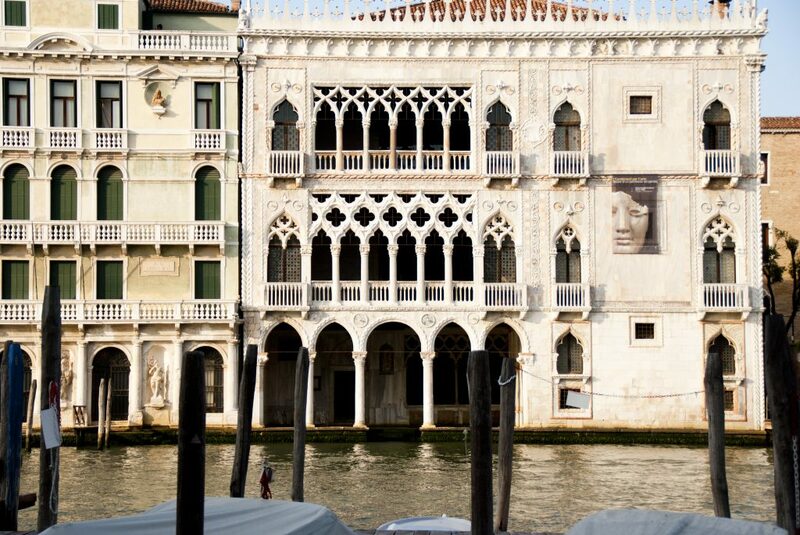 Look up and let’s be swept away by the one-of-a-kind appeal of Venice’s architectural finery. What are the most enchanting, must-see Venetian palaces? Let’s find out about some of these sophisticated pearls of rare beauty, starting from the sumptuous palaces on the Grand Canal and then some of the tiny gems on Venice’s little “calle” and canals. 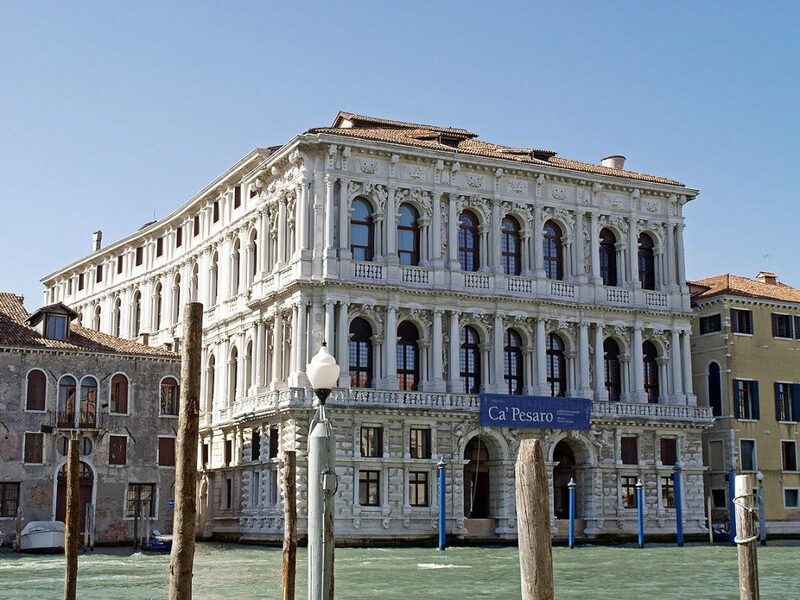 Let’s start from the Grand Canal and one of the finest examples of Renaissance architecture on it, Palazzo Vendramin, or more exactly, Ca ‘ Vendramin Calergi, the current site of the Venice Casino. The palace was built between the late 15th and early 16th centuries. Architect’s identity is uncertain. The immediately eye-catching exceptional interplay of light and shadow brings to life the elaborately decorated facade of white marble on three levels with Doric, Ionic, and Corinthian columns. Five large mullioned windows enliven the facade on the two upper levels. The interiors and the large stairway are decorated mainly in stucco. Ca ‘ d’Oro may be the most prestigious example of Venetian late Gothic architecture. The palace’s facade features strong asymmetry between the left part — on which three perforated sections are stacked (a portico for mooring boats on the ground floor and loggias on the upper floors) — and a part featuring fine marble cladding, single-lancet and isolated square windows. The reason for these atypical features was because the palace’s left wing was never built due to lack of space. Its large cornice gives the facade continuity. The palace features a particularly refined top battlement closed on the sides with twisted small columns. The portico on the ground floor is open to the water with five large arches, echoing Byzantine porticos. Palazzo Contarini del Bovolo: a tower on the water! 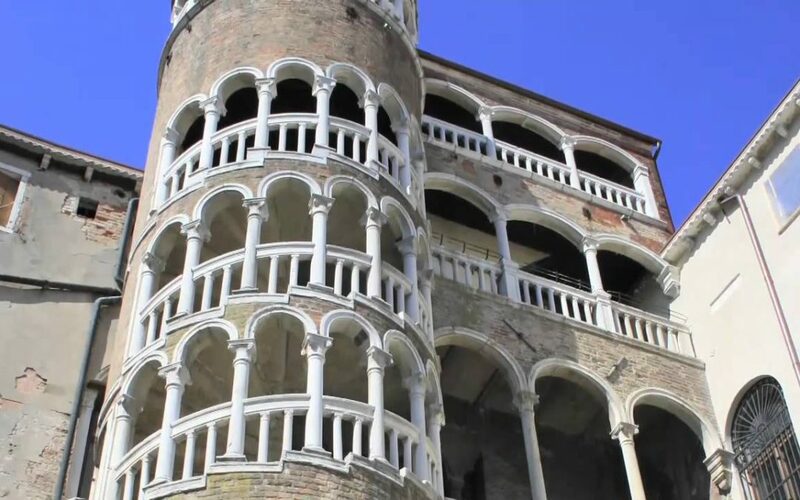 Another remarkable and absolutely original example of Venetian architecture is Palazzo Contarini del Bovolo, built between the 14th and 13th centuries. It has two completely different facades. The front one is spare and elegant, The back one, facing Corte del Maltese, is more unusual for its two distinct juxtaposed parts. On one side it has four rows of rectangular and round-arched single-lancet windows. 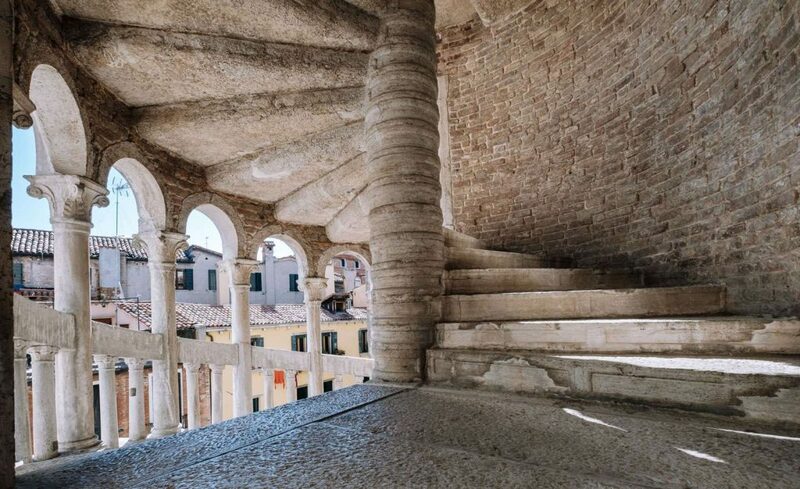 To the side, there is the famous spiral stairway (“bòvolo” in Venetian dialect.) which is where the edifice reaches its greatest expressive intensity. This architectural element is a recurring theme in Venetian palaces of the time, achieving exceptional proportions in Palazzo Contarini. The tower is elaborately decorated with juxtaposed single-lancet windows climbing to the peak and ending on the top with a domed belvedere affording a magnificent view of Venice. Palazzo Contarini del Bovolo is, beyond question, one of the most interesting palaces in Venice. 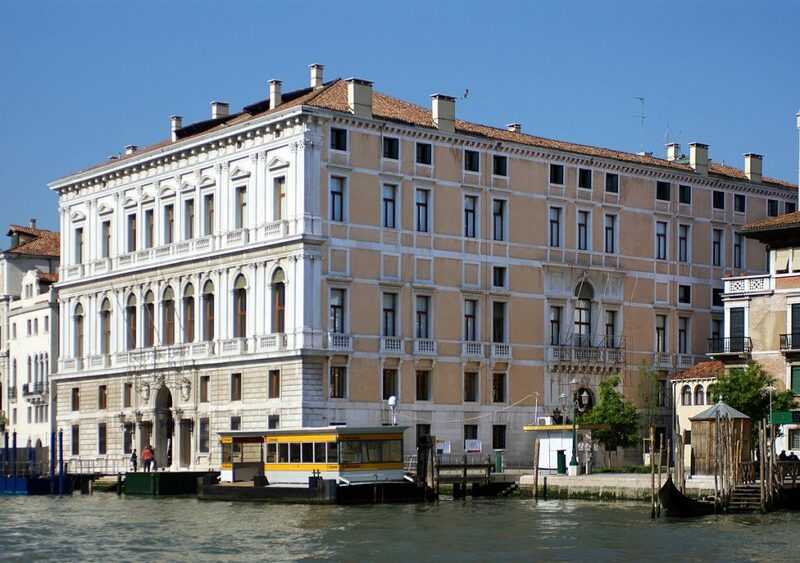 And now, let’s talk about Palazzo Grassi, which is another major Venetian palace on the Grand Canal. famed for holding Venice’s leading art exhibitions. It is also said to be the last noble edifice built on the Grand Canal before the collapse of the Serenissima Republic. 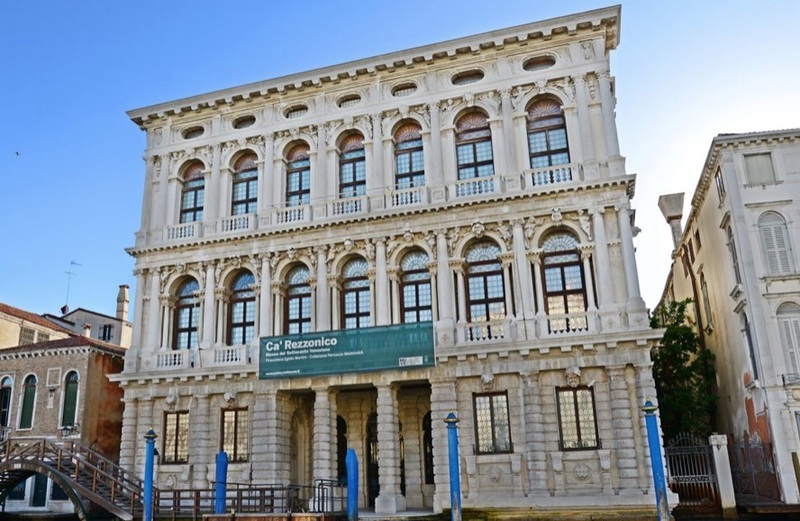 Located at a corner, Palazzo Grassi features two large joined facades. The facade on the Grand Canal is in neo-classical style with majestic proportions and its front door open right on the water. The side facade is in a similar style. A grandiose internal courtyard is also well worth a visit. one Venetian palace definitely not to miss is Ca’ Pesaro in the Santa Croce district. 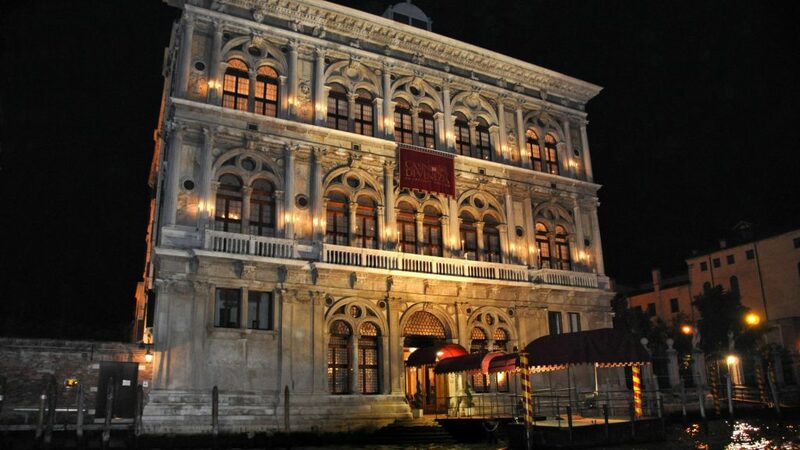 This majestic palace, also on the Grand Canal, was designed in the 17th century. This palace is famed in Venice, considered one of its most important because of its great mass, the quality of its decorations, and its grandeur. Inside there are allegorical frescoes on the ceilings, bas-reliefs on the walls, and statues. The Baroque style facade is also elaborately decorated with prominent bas-reliefs that create a quite powerful sculptural effect through the interplay of light and dark. The upper floors feature beautiful round arches on the facade, which are also lavishly adorned. One projecting diamond ashlar decoration on the bottom adds to the beauty of the whole. Ca’ Pesaro is currently home to the International Gallery of Modern Art and the Museum of Eastern Art of Venice. 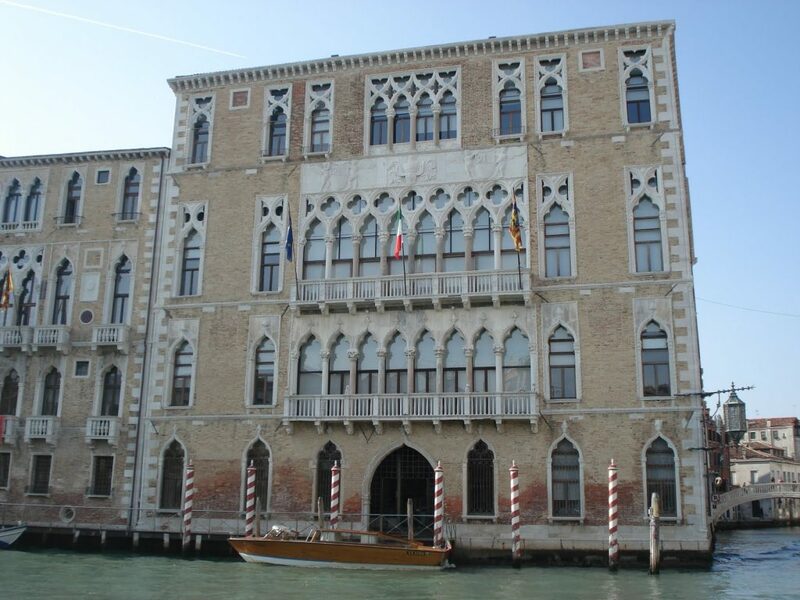 Palazzo Ca ‘Foscari is a Gothic palace, also on the Grand Canal, located in the Dorsoduro area. 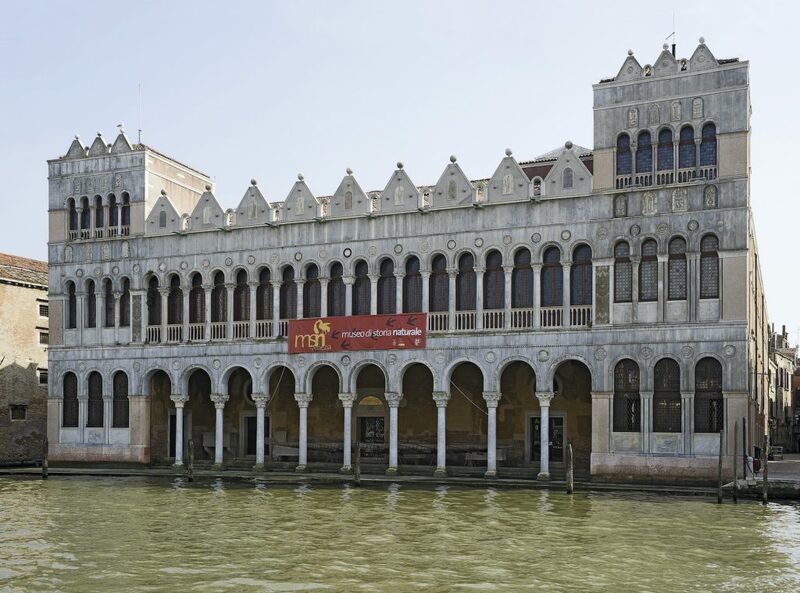 The palace is now home to famous Venetian university that shares its name: Ca’ Foscari. Some elements of the facade are rather reminiscent of the decorations of the Doge’s Palace. The most prominent architectural element is, beyond question, the second-floor loggia. The eight openings, the quadrilobe frieze, and the semi-quadrilobe ends create an effect that the entire facade is expanding. A stone frieze above the loggia bears the coat of arms of the Doge family and a helmet with a lion with wings spread. The frieze was originally adorned with gold and lapis lazuli, but it was damaged during the Napoleonic era. The third floor is also noteworthy. A multiple lancet window here was inspired by that of Ca ‘D’oro. The main portal is also gorgeous, delicately decorated with checkered friezes and with twisted decorations in the interiors. We can’t leave out Ca’ Rezzonico on a list of Venice’s finest palaces. Also in the Dorsoduro district and on the Grand Canal, it is home to the Museo del Settecento Veneziano. The palace’s facade is grandiose and monumental. It is divided into three horizontal bands: the ground floor is embellished with ashlar decorations and a three-lancet water door with architrave; the two piani nobili are decorated with columns and round windows with notched tops. The mezzanine of the penthouse is decorated with single-lancet oval windows, concealed in the facade’s complex design. This Palace’s floor plan is quite complex. Among most impressive rooms, there are the lavish ballroom, covering two floors in height, and the entrance dominated by a majestic monumental staircase. Among Venice 10 most beautiful palaces, Palazzo Fortuny! This palace, located in the San Marco district, has a Gothic style facade. Palazzo Fortuny is one of the few important Venetian Gothic palaces not on the Grand Canal. It stands out for its great size and three impressive facades. The most interesting of these is the facade on Campo San Beneto. The facade has two eight-lancet central windows with a pointed arch and other more spaced openings on the sides. One of the finest Venetian palaces is this singular palace, the Fontego dei Turchi in the Santa Croce district, on the Grand Canal, like many of the others. The edifice covers two floors and was restored in the 19th century in the Venetian-Byzantine style of the 17th century. It is now home to the Civic Museum of Natural History. The facade on the ground floor features ten round arches and a loggia with eighteen minor arches, a pattern inspired by the original facade. Architect Berchet added two turrets to the side that extend on all three levels. The entire facade is topped by battlements, not part of the original project. Many of the decorated materials used in the restoration were inspired by Byzantine architecture. Lastly, among Venice 10 most beautiful palaces, we can’t skimp on attention to Venice’s most famous, oft-photographed building: The Doge’s Palace. This palace is the finest expression of Venetian Gothic architecture, part of Piazza San Marco’s monumental complex. 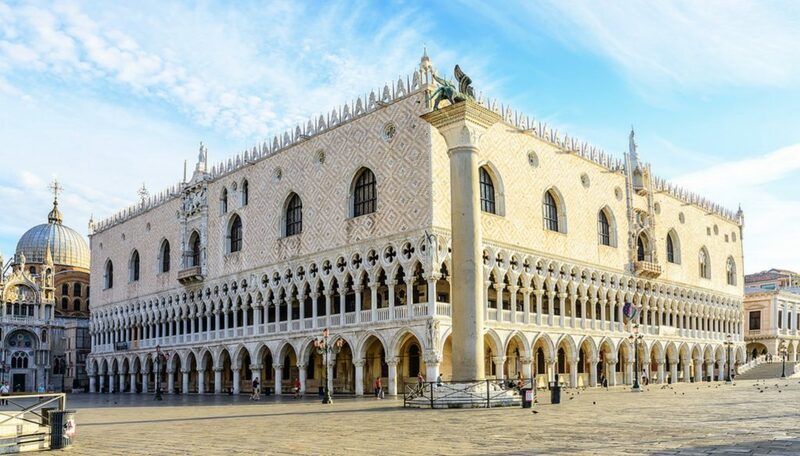 The Doge’s Palace is unlike any in the world, a masterpiece joining Venetian Gothic style with Byzantine and Eastern influences. The city of Venice’s symbol, the palace was once the seat of the Venetian doge and magistrates. Its facade features a completely original architecture, unlike any of its kind. The heavy bulk of its main structure is surprisingly supported by refined slender inlaid colonnades. The facades extend for two levels of colonnades topped by a powerful inlaid marble structure. Large ogival windows and a beautiful adorned monumental central balcony open here topped by small cusps and corner edicolette. This unusual name, meaning Door of Paper, came from the habit of using this new to post new laws and decrees. The elaborate sculptural decorations were originally painted and gilded. They have two side pinnacles representing the Cardinal Virtues. On top is the bust of the Evangelist topped by a figure of Justice with sword and scales. The Doge Francesco Foscari is represented in the center on his knees in front of the winged lion. Visitor’s entrance to the building is from the “Door of Wheat,” so-named because it was once the location of the Office of Fodder. The entrance corridor comes to the courtyard, completely surrounded by porticos topped by loggias. The palace interior is definitely worth a visit. We suggest reserving to avoid long lines at the ticket office. Inside, admire the gorgeous monumental staircases, sumptuous rooms, loggias overlooking the lagoon, and a remarkable collection of paintings by some of the best Venetian artists, such as Tiziano, Tintoretto, and Tiepolo. A guided tour is available if you want to discover the Secret Itineraries of the Doge’s Palace, check out the prison cells, and passageways usually closed to the public.